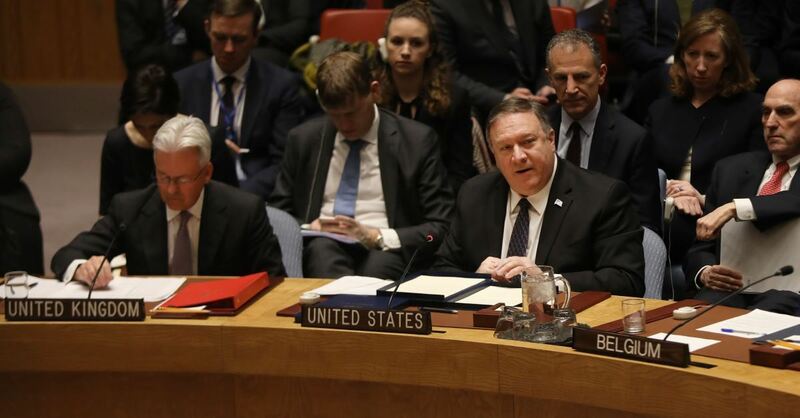 The United Nations Security Council met Wednesday in an emergency meeting to discuss and to condemn the U.S. for recently recognizing Israel’s sovereignty in Golan. Fourteen states at the meeting condemned the U.S. decision. Then last week, President Trump declared that the area was under Israel’s sovereignty. Russia also criticized the decision Wednesday evening. “If anybody feels any temptation to follow this poor example, we would urge them to refrain from this aggressive revision of international law,” Russia’s deputy ambassador Vladimir Safronkov said. Israel’s ambassador to the United Nations Danny Danon, however, said the U.S. was right in its decision. “It’s been a month since the #UN discussed Assad’s war crimes against the #Syrian people. Yet, it took less than 24 hours for the #UNSC to call a meeting on #US recognizing Israel’s sovereignty over the Golan Heights. Syria’s war can end, Israeli sovereignty will remain forever!” Danon tweeted. “No nation in the world would give up strategic land to its most dangerous enemy. Without the Golan Heights, #Israel will find Iranian soldiers on the tip of the Sea of Galilee. We will never let that happen! #UNSC,” he added.